Theatre is a work of a team. The actors perform on stage and only go behind the wings to don a different character for a comeback. But what if the real actors are not humans but are rather puppets being controlled by strings and rods? 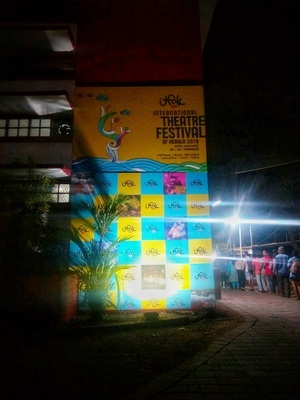 This year’s edition of International Theatre Festival of Kerala witnessed water puppetry, a unique style of theatrics based on centuries old Vietnamese folk art whose genesis lies in Hanoi. Vietnam as a South-Asian country is famed for its diverse culture, quintessential landscape of paddy fields and rich history embedded with folklores, mythical tales and fables. A concoction of this was presented by Thanglong, who’s in practice of Water Puppetry for 19 years and are trying to keep intact its glory in this fast-growing digital age. Under their Director Mr. Chu Luong, the group has been performing alternately everyday in Hanoi but had their own share of difficulties since the beginning. “There was a time when our artists barely make ends meet and were compelled to have a second job, usually labour works. However, we survived through our consistent effort and scheduled performances”, tells one of their members. The group have now become one of the most popular attractions in Hanoi and have been adapting to the changes of the world to make art survive. “We have incorporated a new ticketing system to make it easier for all audience, on the other hand, we use a modern lightning and sound system during the show in combination with live music and traditional instrument. We believe that the core to water puppet is to remain the traditional in essence and use technology to enhance that”. Primarily created for recreational purpose by peasantry of Vietnam, Water Puppetry mirrors the issues faced by the farmers due to natural disasters and difficult environment. The artform follows the path of minimalism by using basic and rudimentary materials like Fig Wood to carve puppets, as the wood can’t be used for other utilitarian purposes. Historically, the aboriginal masses in their leisure time used to carve these puppets to stage shows at grassroot level for an entertaining visual treat. 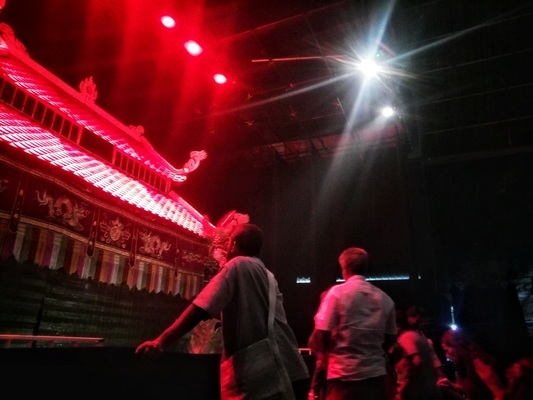 Situating the artform in the modern context, at Sangeet Natak Academy, the puppeteers of Thanglong group didn't forget to abide by the rule of minimalism. 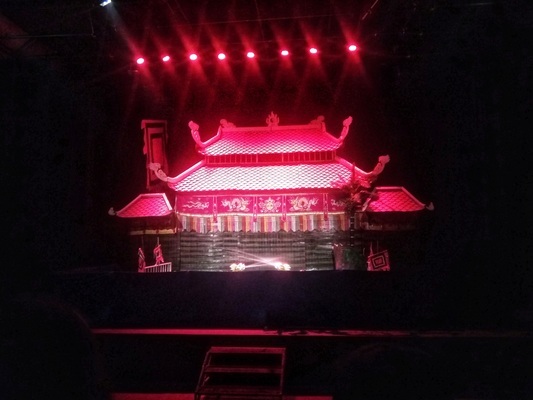 They used a Pagoda (bamboo curtain) as a hiding screen to stand behind, in waist – deep water, to control the animated puppets for the entire length of the show. The figures in the puppet show were indigenous where the audience was transported to rural setting with characters like a fisherman and his wife juggling with their routine chore of catching fishes, or a boat race by villagers, or young lads swooshing with playfulness in pond. On the contrary front, Vietnam being the citadel of multiple dynasties, the land of kings, queens and eternal mythical fables adds a flavour of magic realism to this theatre. The dance of the dragons spouting water, puppets performing trance rituals, fairies, flies, vibrant ducks performing the process of procreation, and water snakes reviving the myth of sword tickles the audience with delight! At this moment the lines between actor and animated puppets gets blurred and an all encompassing wave of exuberance cheers the audience. To create a fantasy-like and whimsical world, Thanglong group played with mock–heroic style of narration that is best suited for chronicles and prophesies. The musical recital of fables, poems, historical tales encapsulated the literary background of Vietnam. Percussions like cymbals, gongs, horns and shells, bamboo bells further bind the rhythm of performance and intensified the enigmatic aura by controlling of tempo. The tone and tenor of recitals and edgy music complements the snippets so well that language ceases to act as a barrier. “The show was a hit and offered something that is so jubilant in character that first time spectators would be very enthralled” said the festival curator Arundhati Nag. Just like every story gains power with retelling, this play too chronicled the diversity of the otherwise mysterious Vietnamese culture and touches a universal theme of celebrating ‘little joys of life’. The 11th edition of ITFoK, an initiative by Sangeet Natak Akademi and Government of Kerala was held from 21st-26th January at Thrissur.